Your BIOZEN beauty center for men and women advises you this facial treatment to reduce the fine lines and wrinkles with “Prelude 108” lifting serum, effective from the 1st treatment. Who should use this anti-wrinkle facial treatment “PHYT’S Aromalliance Multivita”? This anti-wrinkle lifting treatment “PHYT’S Aromalliance Mutivita” is suitable for people wishing to fight the signs of age, fine lines and wrinkles, and mature skin lacking firmness. How is an anti-aging facelift “PHYT’S Aromalliance Mutivita” work? 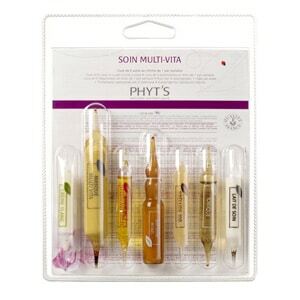 This anti-aging facial treatment “PHYT’S Arommalliance Multivita” starts with cleansing and scrub the skin. As required, steam and extraction of comedones (blackheads) to be followed. Then comes the treatment phase with Prelude 108 repulping and lifting serum. Then, the specific massage with the anti-aging serum. When laying the mask with vitamins and anti-wrinkle care, an intense relaxation is felt. What are the results of the anti-aging facial treatment “PHYT’S Aromalliance Mutivita”? The results of PHYT’S products are tested and proven in the laboratory. This anti-aging facial treatment “PHYT’S Aromalliance Multivita” will allow reducing the wrinkles thanks to the Ceveblé and Provitamins A&C. Anti-wrinkle Serum reduces the total area of wrinkles by 37%. It regenerates, targets wrinkles, allows a tensor effect, and an anti-free radical action. How often do you do an anti-aging facial treatment “PHYT’S Aromalliance Mutivita”? It is advisable to do an anti-aging facial treatment “PHYT’S Aromalliance Multivita” on average once a month or in a 4 treatment course (1 treatment per week). What is the price of an anti-aging facial treatment “PHYT’S Aromalliance Mutivita”?